Read what to pack for a lake trip with kids, here. This isn't just important to pack for your kids, but also important for you! Be sure to pack a bottle of sunscreen, and then pack a few extra just in case. Since Aimery and I are both fair-skinned, I try to reapply sunscreen every 45 minutes while in direct sunlight, and of course after being in the water! No, not just snacks for your toddler - snacks for YOU. I love to pack fresh fruit, vegetables, hummus, and cheese and crackers on beach days! Grapes are always a must-have since they can help with hydration. I like to pack everything in containers so nothing gets lost on the bottom of my bag! I always make sure to pack a bottle of water, and also some electrolyte packets to make sure I stay hydrated during hours in the sun. And I ALWAYS keep an extra gallon of water in my car in case we run out of water and need more. I never forget to take my vitamins while I'm on vacation! I always make sure to take them before heading out the door to the beach. 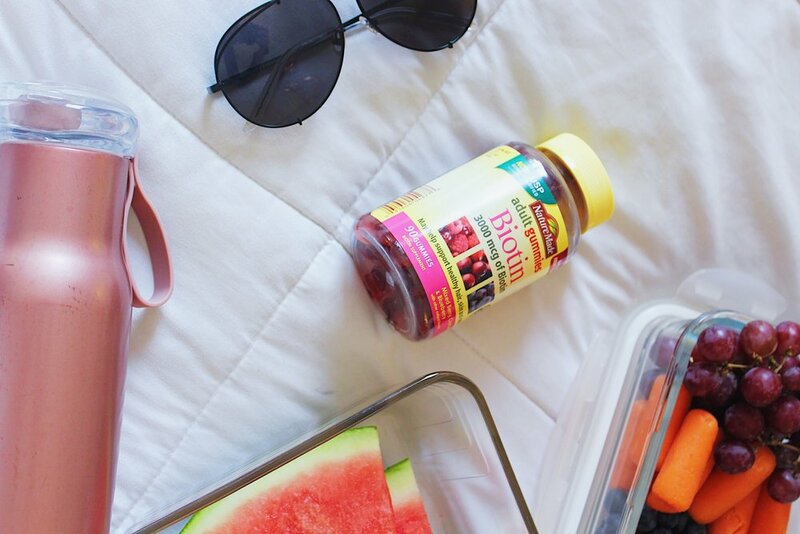 Biotin is a must-have supplement because it supports healthy hair, skin, and nails for moms like me that are biotin deficient!† My favorite is Nature Made® Biotin Adult Gummies! I prefer the gummies over normal pills for obvious reasons... they are great-tasting and taste like candy! And even better, these vitamins provide 3000 mcg of biotin and are USP Verified for potency, purity and quality. You can pick them up on your next shopping trip to Walmart! Read tips for traveling alone with a lap child, here. Don't forget to pack your cute sunnies to keep the rays away! Oh my goodness. I can't count the amount of times one of my phones have been permanently damaged due to water and sand. I've learned my lesson and always bring a gallon-sized ziplock bag to throw my phone, headphones, and wallet in while not in use! You need a great bag that fits EVERYTHING I've already listed, plus a bunch of towels and beach toys for your kids. Make sure to bring one that has a comfortable shoulder strap so you don't mind carrying it with you everywhere you go. The one I'm using is collapsible which makes for easy travel and I love that it's unique - I don't have to worry about another mom mistaking that it's hers! Have fun at the beach, babes! Comment your must-haves below!